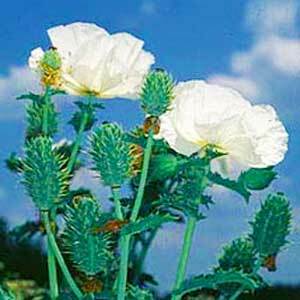 Prickly Poppy (Argemone mexicana) is native to Mexico, Southern and Western United States, and has been naturalized in Brazil, Hindustan, Africa, and other subtropical and tropical places. The leaves alternate, with woody, spine-tipped lobes and whitish wax that rubs off, with flowers that have 4-6, bright yellow petals and many stamens. The herb and flowers are smoked by natives for its relaxing properties, but please note that smoking anything, even when it's a natural herbal product is dangerous to one's health. IMPORTANT NOTE: This is a very prickly, woody herb and will arrive with many stems.